HMicro has licensed and deployed CEVA’s RivieraWaves Sense WiFi IP in its WiPoint Wireless Technology platform, the licensor of signal processing IP for smarter, connected devices, Ceva, and HMicro, a wireless solutions firm developing integrated products for medical, industrial and the broad Internet of Things, have annouced. The WiPoint platform was specifically designed to address the challenging requirements of wireless peripherals in healthcare and the broad IoT, particularly areas demanding industrial grade reliability. It integrates the RivieraWaves WiFi IP together with HMicro developed RF/analogue and other technologies including Ultra WideBand (UWB) and Medical Band (MB) radios to form a power-optimised triple-mode hybrid radio based solution that seamlessly transitions between the three options as needed, maximising link integrity and ensuring the lowest power option is chosen when more than one is available. The WiFi portion of the radio is optimised for excellent energy efficiency—days of continuous operation from a coin cell – enabling applications previously not feasible with WiFi. The WiPoint technology platform is already in design with leading medical equipment manufacturers developing wireless monitoring patches that sense patient vital signs and other metrics. 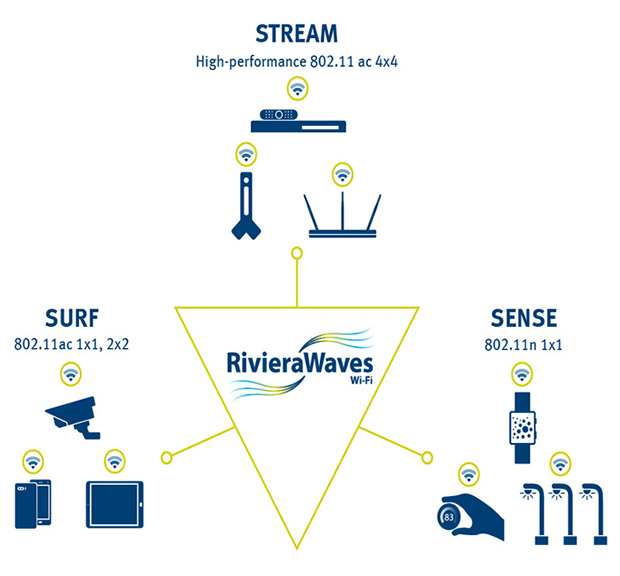 CEVA’s RivieraWaves WiFi IP family offers a comprehensive suite of platforms for embedding WiFi 802.11a/b/g/n/ac into SoCs/ASSPs. Optimised implementations are available targeting a broad range of connected devices, including smartphones, wearables, consumer electronics, smart home, industrial and automotive applications.